Unique design ensures simple instrument set-up. Test specimens are mounted to a sliding platform that moves in a horizontal, reciprocating motion under a stationary tool holder. A counterweight enables the operator to balance the test arm prior to applying the test load, thus ensuring the exact load will be applied. An adjustable gantry allows the test system to be positioned according to the height of the specimen. Test parameters such as stroke length, speed and load are adjustable. Optional attachments provide versatility to satisfy numerous test requirements. Incorporated at the end of the test arm is a tool holder to which optional attachments and weights are secured. Ideal for flat surfaces, the Taber Reciprocating Abraser can be configured to evaluate the susceptibility of a material surface to abrasion, scratch, scrape, rub, plus many other physical properties. 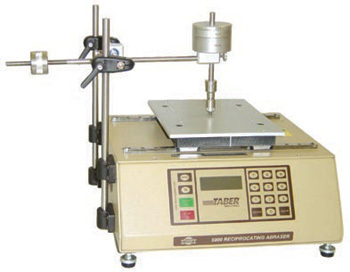 With optional accessories based on GM test methods, this apparatus will also test the abrasion resistance of textile specimens using various friction media. Maximize testing time with extra test arm assembly kits. Using additonal test arm kits (sold separately), the Taber Reciprocating Abraser can test up to three specimens simultaneously to increase technician output or compare different product formulations at the same time. Calibrase® CS-8, CS-10F, CS-10, CS-17 P.O.R. Calibrade® H-10, H-18, H-22, H-38 P.O.R. Scratch Tips (various configurations) P.O.R. Multi-Mar Scratch Attachment (45° or 90°) P.O.R. ScotchBrite® Abrasive Pad Kit P.O.R. Pencil Hardness Scratch Kit P.O.R.